Am I the only person that actually likes this game? For one, I don't get the hate this game gets. No, it's not Yoshi's Island. It wasn't meant to be. 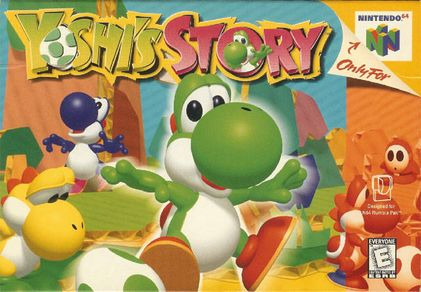 But once you learn to accept it for what it is, it's a fantastic platformer and one of the best on the Nintendo 64. Awkward level structure and overwhelming cuteness aside, this game is very fun. 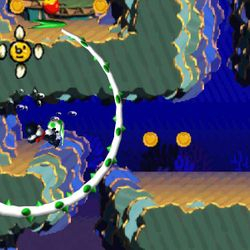 One of the biggest draws of the game at the time of its release was its graphics. 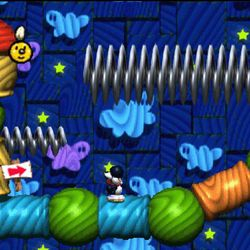 It was originally labelled as being "2.5D", a 2D platformer with 3D elements. While I definitely wouldn't call it 3D in the least, it's a very beautiful game. I love the textures used in all of the stages, how the grass is cardboard, or you're walking on clouds made of fabric, and oh let's not forget the water! The water is some of the most beautiful looking water in any 2D platformer - even in 2014. The graphics are unique and charming - on the same level of Kirby's Epic Yarn which also had that "homemade" look. The visuals are crisp, vibrant, and a feast for the eyes. Even today it still looks good. 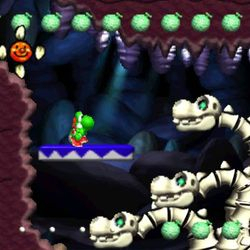 While the cutesy Yoshi noises sometimes gets on your nerves, the music is very well done. 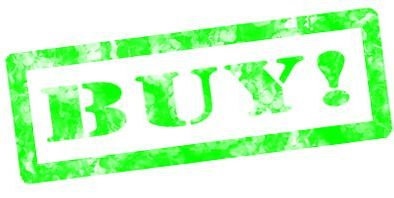 The music fits each level it was designed for and most of them are very catchy and memorable. I found myself humming certain tunes well after I finished playing the game. Even years later I still remember most of the tunes. Its soundtrack is just very, very good. 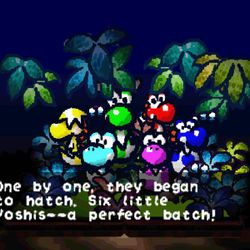 The one track that is a bit annoying is the one in between levels where the Yoshis "sing" but that is only one bad apple in a tree of golden deliciousness. Rather than getting to the end of the level, your goal is to eat 30 fruits. Depending on the fruit you eat you get more or less points. There are 30 special melons hidden in each stage and finding all 30 results in the highest possible scores. So yes it's a bit different than your usual platformer, but it's still a lot of fun. Of course you could just eat any 30 fruit and be done with it, but you won't get very many points for that. In fact, you probably won't even get to see the whole level if you do that. There is also no end to a level, it keeps looping around until you eat 30 fruit. 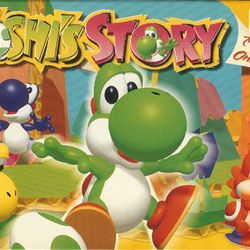 Not to mention each color Yoshi has a favorite fruit, for instance a red Yoshi likes the apples the best, so eating apples as a red Yoshi will result in more points than eating another fruit. As far as controlling Yoshi goes, it's very easy to do. You can run, jump, and float just like in Yoshi's Island for the Super NES. Not to mention swallow foes and throw eggs, except now you can throw eggs wherever you want, rather than waiting for a cursor to line up. Yoshi's life is also measured by petals on a flower, and eating fruit as well as butterflies and little flowers will restore life. It's not a difficult game, but if you care about setting the highest possible score on a given level, you will be hard pressed to find every melon in each stage. The amount of replay value varies for everyone and it really all depends on how much setting high scores drives you to play more. It's a relatively short game (24 levels) but the way it's structured is a bit awkward. Rather than playing through all levels in a world then setting off to the next world, you play one level per world, so in one sitting you play 6 levels, 1 level per world in each of the 6 worlds. The levels you can access are limited by the amount of hearts you find in the previous level. There are 3 hearts in each level. In addition to opening access to new levels, hearts also add points to your score. So opening all 24 levels does require a minimum of 4 playthroughs, but then you can replay any individual level over and over again to get the best possible score. If vying to get the best score isn't your thing then you probably won't get very much replay value. If it is, you're in luck. This game is one of the most fun 2D platformers in the last 16 years, as long as you give it a chance. It's cute, it's charming, it's easy to play, and it's fun. You can make it more or less challenging depending on how bad you want a top score. All in all, it really comes down to what you want to get out of it. Think of it almost like Mario Kart where you keep going back to the tracks to get the best time. Just like that, you can play this game for a very long time if you keep competing with yourself. Even 16 years after its release I still play this game, still find it fun, and still compete with my old scores.